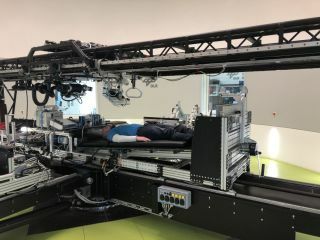 The short-arm centrifuge at the German Aerospace Center's :envihab facility in Cologne, Germany, will be used during the first joint long-term bed-rest study commissioned by the European Space Agency and NASA to investigate the potential of artificial gravity in mitigating the effects of spaceflight. The study begins March 25, 2019. Some brave people will lie down for science soon — and they won't get up for a long, long time. A 60-day bed-rest study funded by the European Space Agency (ESA) and NASA begins in Cologne, Germany, on Monday (March 25). Eight male and four female volunteers will take to the beds at the German Aerospace Center's :envihab facility, to help scientists better understand how spaceflight affects the human body. The scientists call the experiment the Artificial Gravity Bed Rest Study, according to German space officials. If you think this sounds like a dream gig, you may want to reconsider. For starters, there's no sitting up; each volunteer must keep at least one shoulder in contact with the mattress at all times. And the beds' head ends will be tilted 6 degrees below the horizontal, so blood flows away from the participants' legs, ESA officials said. In addition, the poor folks will be regularly plunked into a centrifuge and spun up, to push blood back out toward their extremities. A bed-rest-study bed at the German Aerospace Center's :envihab facility in Cologne, Germany. The centrifuge bit is an attempt to gauge the real-life potential of artificial gravity — a long-running sci-fi trope — to combat the worst effects of weightlessness. This will be the first long-term ESA bed-rest study to employ :envihab's short-arm centrifuge, and the first conducted in collaboration with NASA, ESA officials said. A close-up of a monitor in the control room of the German Aerospace Center's (DLR) short-arm centrifuge, which the European Space Agency and NASA will use to study the effects of artificial gravity on the human body during long-duration space travel. Researchers will perform a variety of experiments during the study; they'll measure participants' cardiovascular and cognitive performance, balance and muscle strength, among other factors. Such data will help ESA, NASA and their partners prepare for crewed treks to the moon, Mars and other deep-space destinations, project team members said. "To make these missions possible, various risks to astronaut health must be minimized," ESA team leader for research Jennifer Ngo-Anh said in a statement. "This study allows us to address the issue of muscular atrophy caused by weightlessness, but also other stressors such as cosmic radiation, isolation and spatial restrictions."